Last week at the MarketingProfs B2B Marketing Forum in Boston, I saw Tim Washer present on using improv to create video content for B2B marketing. Much to my surprise, Tim talked about much more than content strategy, delving into his own background, which brought us to his journey from businessman to comedian and back again. This really struck me. A discussion about fear was so far removed from what I had expected this session to cover, and yet the message resonated powerfully. How counterintuitive: Run toward things that scare you. Looking back on my own career, I can see how right Tim is. As a child, I sang nonstop, cracked jokes to strangers, wrote poetry, and generally pursued every creative pastime possible. I used to introduce myself as “Wonder Woman” to strangers, and thought that, when I grew up, I’d be a superhero, an actress or a singer. Possibly all three. By the time I reached high school, I considered acting, singing, and writing. At the prompting of my parents (especially my mother), I attended a business college and made plans to continue on to law school. I interned in marketing, but turned down the job offer I received because I’d already been accepted to the law school of my choice. The idea of deviating from the path I’d chosen frightened me: success was so uncertain a prospect, and I couldn’t envision what the journey would look like. By contrast, becoming a lawyer had very clear steps, and a singular definition of success (at least in my estimation at the time). I joined a law firm but at the same time, I was still creating — blog posts, podcasts, and videos — and I began to acknowledge a biting emotion that gripped me at times: jealousy. I attended stage productions at local theaters, listened to talk radio, saw acquaintances pursue careers in theater, broadcasting, music or other creative areas, and instead of feeling joy over their success, I felt jealousy hit me, like a punch in the gut. This was not the person I wanted to be. I squelched the envy and sought to find happiness in my chosen pursuits. Then I saw an interview on Good Morning America featuring Laila Ali, daughter of boxing legend Muhammad Ali. She talked about how jealous she felt watching women boxers fight, and how that feeling led her to the realization that she needed to pursue boxing. Against the advice of her father and countless others, she trained to become a boxer, and found her calling. For the first time, she felt fulfilled, and no longer envious. This sounds strange, but I envied her. 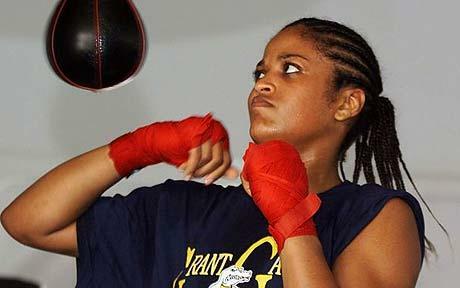 Laila Ali’s jealousy had prompted her to follow her own inner vision. I had the jealousy, but my fear stopped me from acting on the desires that it revealed. How foolhardy it seemed to ignore my inner longing: to ignore the valuable insight into my own desires that jealousy and fear brought me. Would any marketing professional ignore such priceless, highly relevant data? I left the practice of law, admitting to myself that fulfillment for me lay elsewhere. All along, my fear and jealousy had been pointing me in the right direction: a career in creating content. Of course, “content marketing” was not a term people used at the time. Nonetheless, a content producer is what I had always been. I reframed my thinking about fear and jealousy. When offered the opportunity to host a weekly podcast for MarketingProfs and interview some of the brightest people in the business, I registered the fear, but told myself it wasn’t uncertainty: just excitement. I was excited at the prospect of pursuing my dream to interview people professionally. I used to envy colleagues who travelled for industry events. I now actively pursue speaking engagements and apply for press credentials at conferences around the country. In the past year, I’ve travelled more than I did in the previous five. In response to such feedback, I now smile while politely disregarding their opinions. I’m not about to jettison my personal or professional goals so they can feel better about their choices. Jealousy and fear still crop up from time to time, but now I welcome them. Examining those feelings reveals desires I never knew I had, or maybe wouldn’t admit to myself. These seemingly negative emotions are powerful weapons in my battle against future regret: use them. Personal fulfillment is not something you can find by looking outside yourself, and your innermost thoughts are trying every moment to point you down the right path. It’s not easy. Have you experienced this?